I really have to hand it to the Mission: Impossible film series, for nearly twenty years and five installments (a relatively low number for that many years, since most movies seem to rush sequel after sequel these days), the series just hasn’t lost its luster. Some say the second and third installments were low points in the series (I personally didn’t mind them), but while most series would see that as a time to reboot the whole thing, Mission: Impossible simply decided to reinvigorate the franchise with Mission: Impossible – Ghost Protocol to great success. This fifth entry, Rogue Nation, doesn’t quite reach the same heights as Ghost Protocol (that’s nothing to be ashamed of, since Ghost Protocol is easily one of the best action movies of the last decade), but it keeps the series’ momentum going at full speed. It’s true that the Mission: Impossible movies, much like the TV series that inspired them, are more about death-defying action scenarios and espionage that are, well, impossible, than anything else. But what Mission: Impossible gets right that so many action movies get wrong is that they treat their action scenes as a story in themselves. 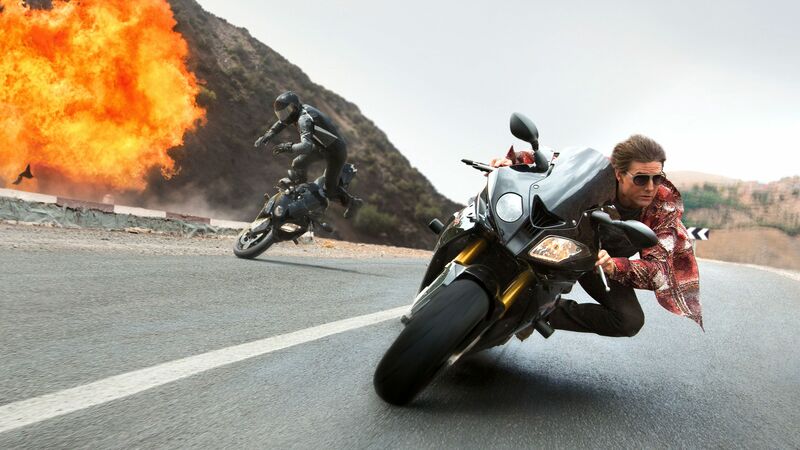 Whereas a lot of action flicks just throw in a bunch of explosions and call it a day, Mission: Impossible’s action scenes are more elaborate, creative, and played out as their own kind of narrative. The action is the story. Rogue Nation continues this tradition with exhilarating action set pieces that see Tom Cruise out Tom Cruising himself. The trailers and TV spots show off the scene where Cruise’s Ethan Hunt is hanging off an airplane as it takes off into the air (a practical stunt that involved no CG, a tradition of the series), and that happens in the first five minutes of the movie! If that doesn’t tell you that the rest of the film isn’t an excited roller coaster of events, I don’t know what will. The action scenes are, of course, the movie’s biggest draw. They’re all terrifically played out, with few of them ever cutting away from the action, and some even going directly into another without the chance to catch a breath in between. There might not be a singular set piece quite as memorable as Tom Cruise climbing the Burj Khalifa in Ghost Protocol, but there’s never a dull moment. The story sees Ethan Hunt tracking down a terrorist organization called The syndicate (named after the recurring criminal organization from the later seasons of the TV series), but the IMF is dissolved by a stuffy CIA director, and Ethan Hunt has to work on is own (recruiting his former teammates along the way of course) in bringing down the Syndicate and evading the CIA. Admittedly, the plot retreads some similar ground as Ghost Protocol (how many times can the IMF be disavowed? ), but again, this is Mission: Impossible we’re talking about. The stories of the action sequences are the real plot. My only major complaint with Rogue Nation is that Ethan Hunt’s IMF teammates seem less important than they did in Ghost Protocol. Benji Dunn (Simon Pegg) gets the biggest supporting role of the returning cast, but William Brandt (Jeremy Renner) and Luther Stickell (Ving Rhames) just feel like they’re along for the ride. A new female lead is introduced in Ilsa Faust (Rebecca Ferguson), who is involved with the Syndicate, which often puts her loyalties in question. Her presence adds some uncertainty to the team, which is a nice little spin on the formula, though nothing that will shake the series to its core. This does bring up another little complaint I have with Rogue Nation though. The film keeps a solid continuity with Ghost Protocol (though it can easily be enjoyed on its own), and brings up the events of the previous film, including the attack on the Kremlin and its big finale. Yet, the female lead from Ghost Protocol, Jane Carter, is never even mentioned. Considering the established continuity, it just seems weird that a key character from the last movie is completely forgotten. These are really not too big of complaints though, when you consider how entertaining the Mission: Impossible series still is at its fifth installment. How many movie franchises can keep up their pace through that many sequels? In short, if you like any of the Mission: Impossible movies, or action movies in general, it’d be hard to not be impressed by Rogue Nation. It keeps the action-fueled spirit of the series alive and well. 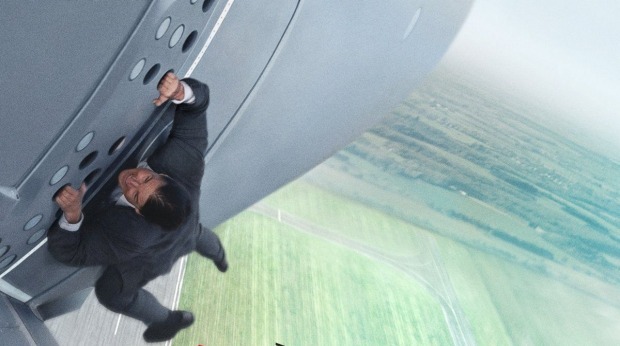 Tom Cruise hanging off the side of an airplane is, literally and figuratively, only the beginning.